For the shortest month of the year, February has many great food holidays. I decided to choose sweet potatoes, not only because I consider them to be a “super food,” but mainly because they remind so much of my late, wise and wonderful grandmother, Ruby Virnelson. Mamma loved sweet potatoes and I think she had at least half of one with her dinner most nights of the week. She liked to take a sweet potato and bake it, cut it lengthwise and spread it with margarine, a little brown sugar and a sprinkling of cinnamon. Super easy and super nutritious. Smart Mamma! Sweet potatoes are chocked full of beta-carotene, vitamin A, vitamin B6, vitamin C, vitamin E, fiber, thiamine, niacin, potassium, copper protein and calcium. In addition, they are just plain good. 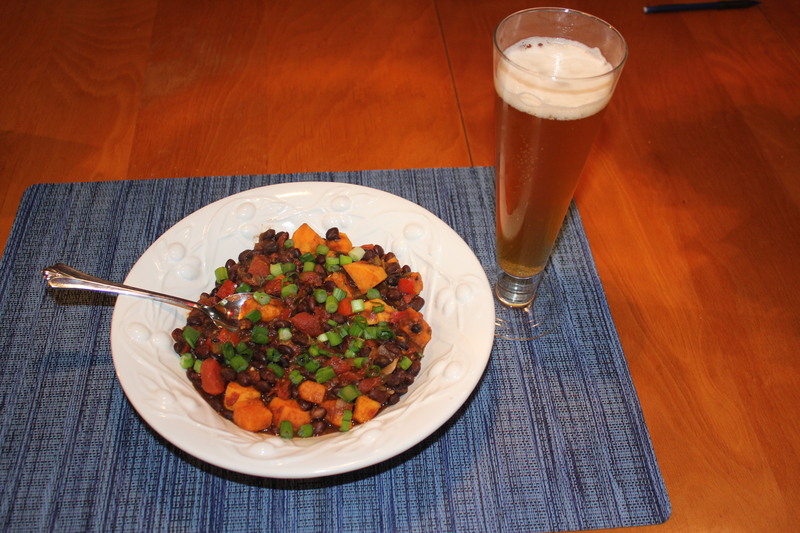 To celebrate national sweet potato month, I’m including a recipe for a wonderful and hearty sweet potato and black bean chili. 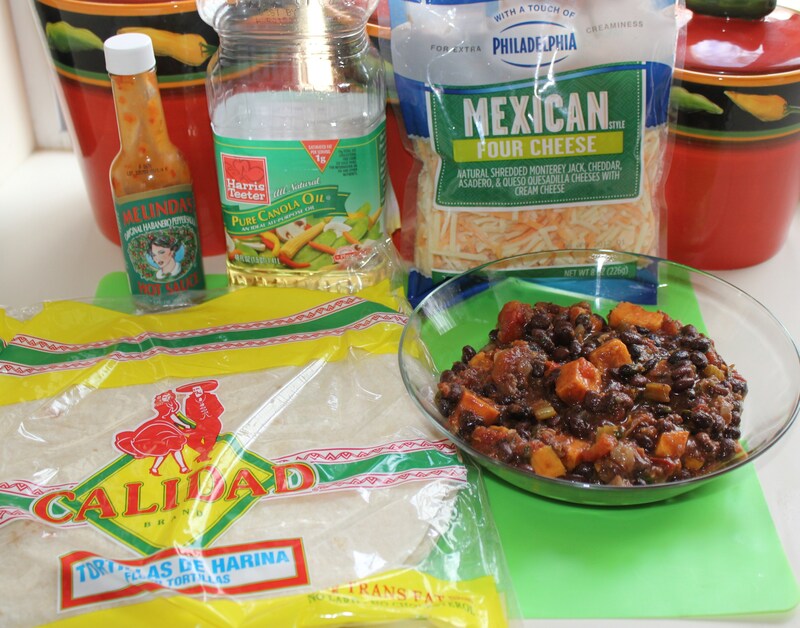 You’ll want to make extra and use some of the leftovers for some tasty quesadillas, and that recipe is also included. 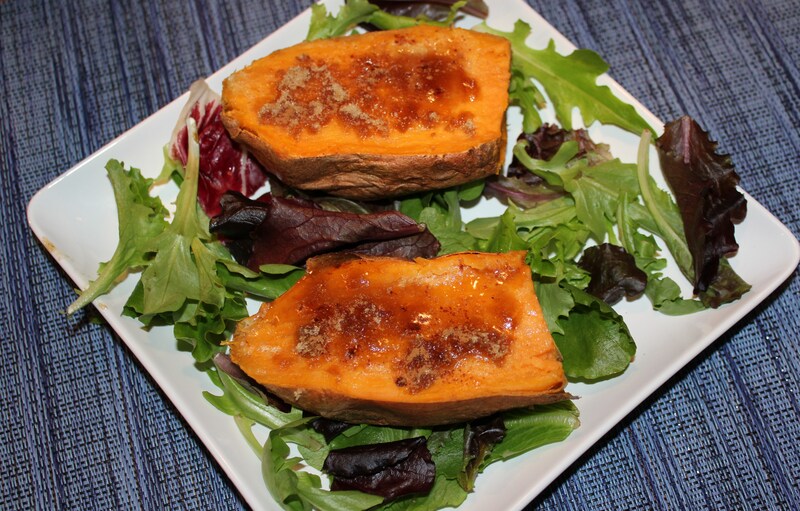 Or try the sweet potato skins I posted about earlier – they are to die for! 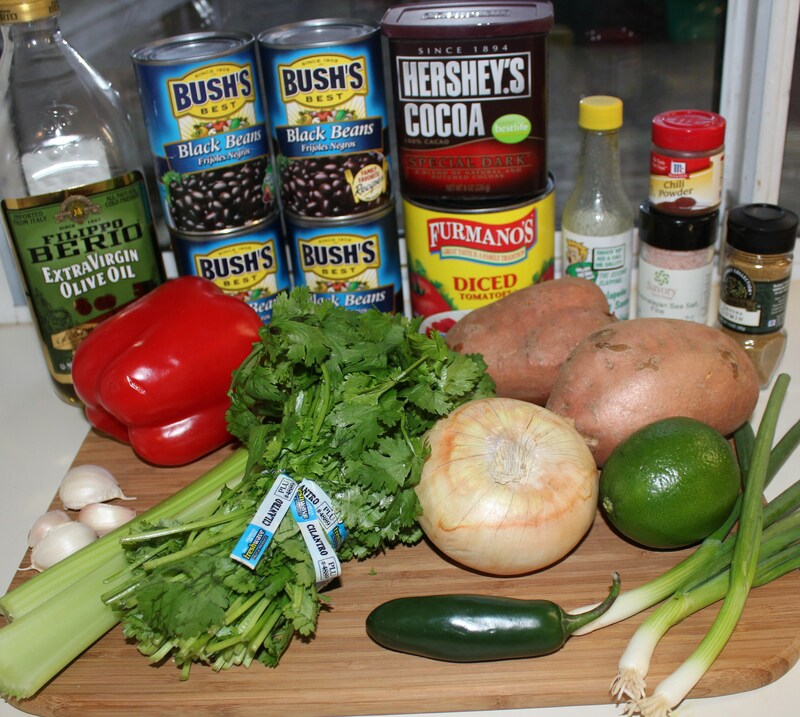 Not only is this chili rich and delicious, but it also is vegan. Trust me, you will never miss the meat. Heat the olive oil in a large skillet. 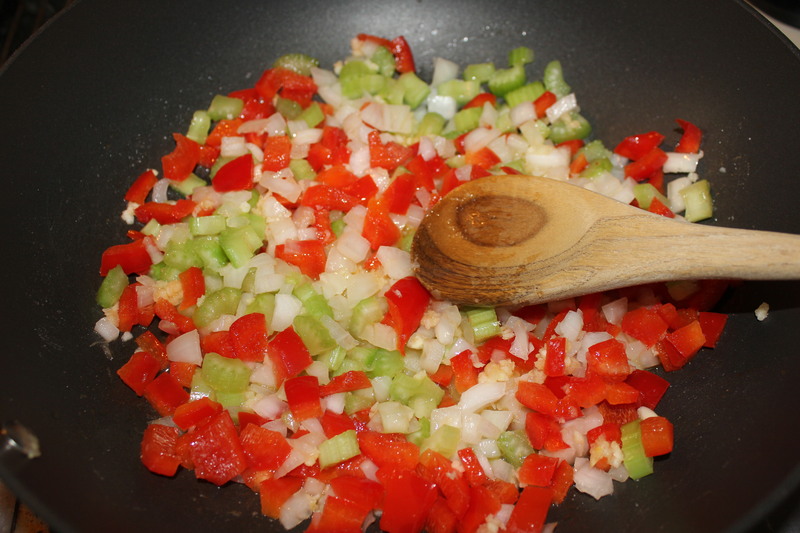 Add the onion, celery, red pepper and garlic and sauté for 3-4 minutes, until soft. 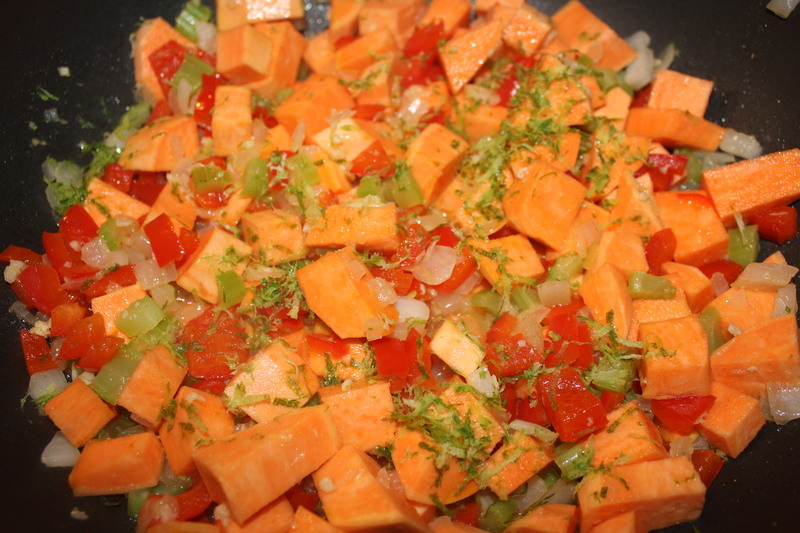 Add the sweet potatoes and lime zest, and simmer for 10-15 minutes, stirring occasionally. 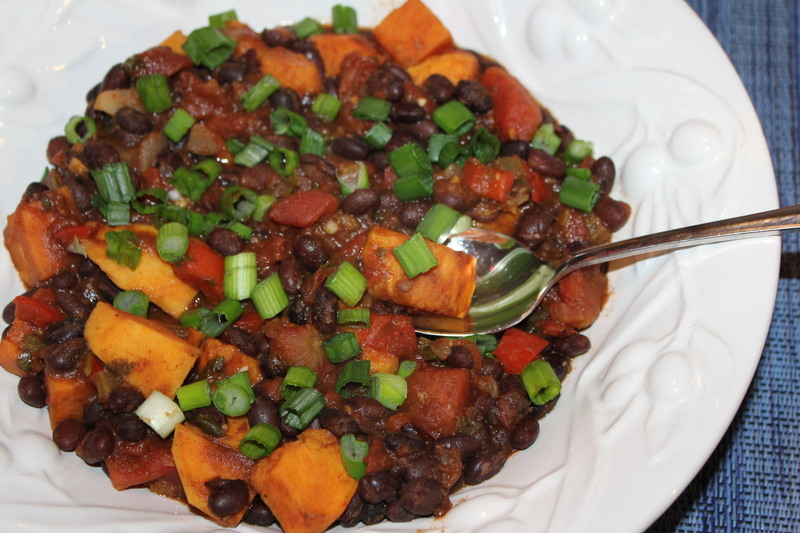 You want the sweet potatoes to be soft enough to eat, but not mushy. 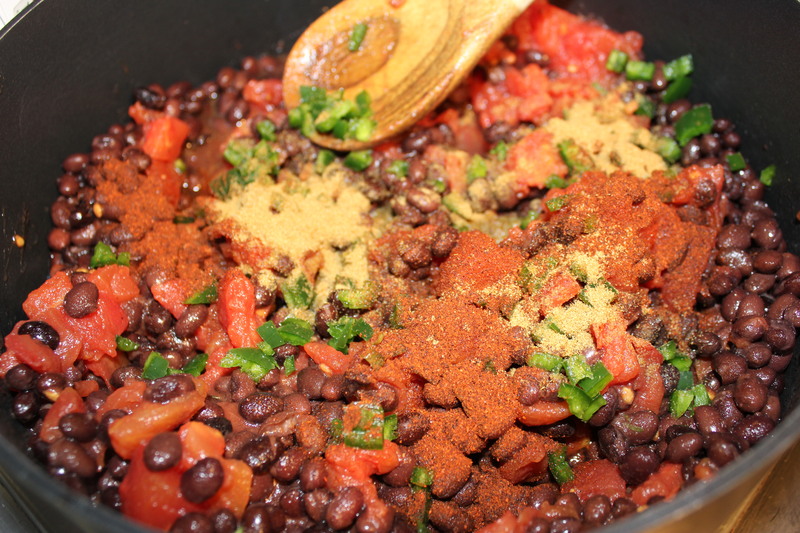 Meanwhile, in a large pot, mix the black beans, tomatoes, jalapeno, lime juice, salt, chili powder, cumin and cocoa and cook over medium heat. 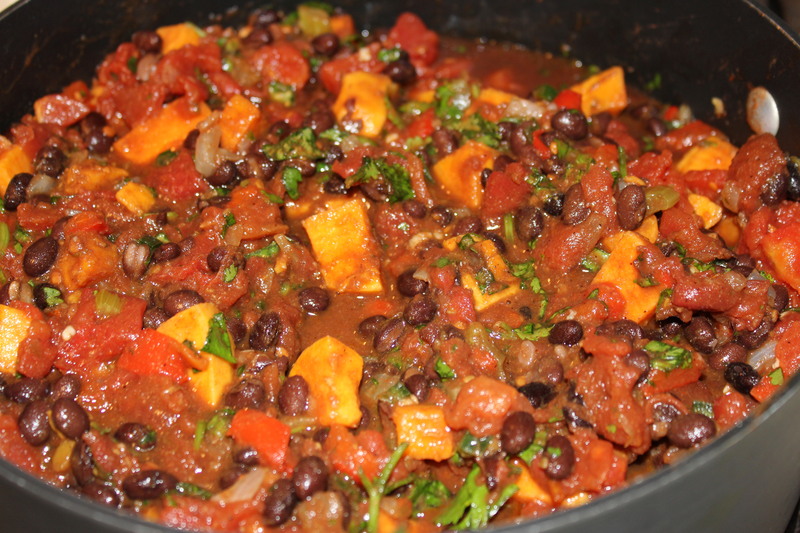 Add the cilantro and then the sweet potato mixture to the beans, and simmer for 10-15 minutes. Garnish with green onions and serve with a salad, chips, breadsticks, cornbread, beer, etc. 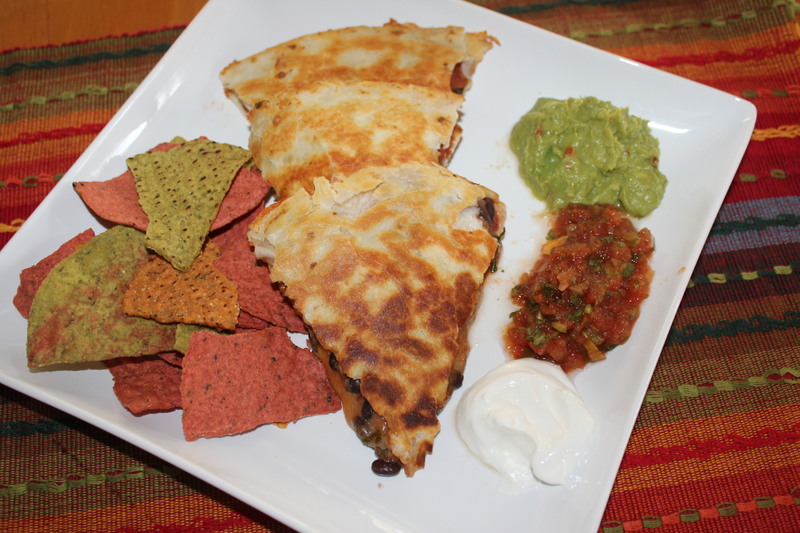 These quesadillas are a great way to use any of the leftover sweet potato and black chili mentioned above. The combination of the cheese and the chili rocks, and again – you will not miss the meat! Place the chili in a colander to strain out some of the liquid. 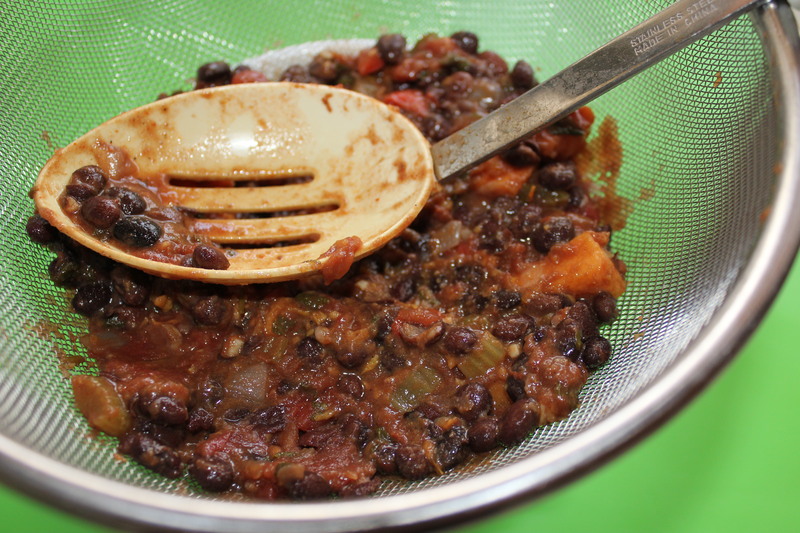 I like to mash the sweet potatoes and beans some before spreading on the tortilla. Heat 1 tablespoon of the oil in a large, flat skillet. 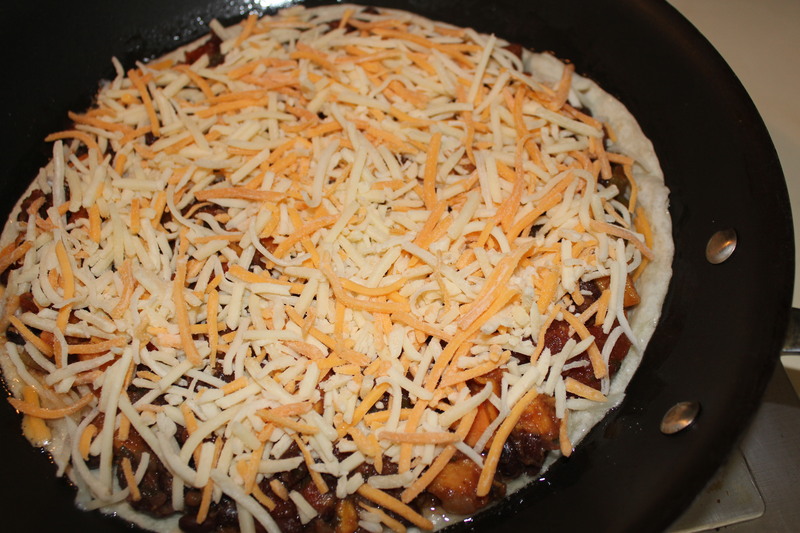 Add one of the tortillas and evenly spread the drained chili on it, close to the edge but not quite all of the way. Add the cheese, hot sauce if desired, and then the other tortilla. At this point you may want to place a heavy plate on top to weight the tortillas down some. Cook over medium heat for 4-5 minutes, until the bottom tortilla is nice and browned. Brush the top tortilla with canola oil and flip it over. 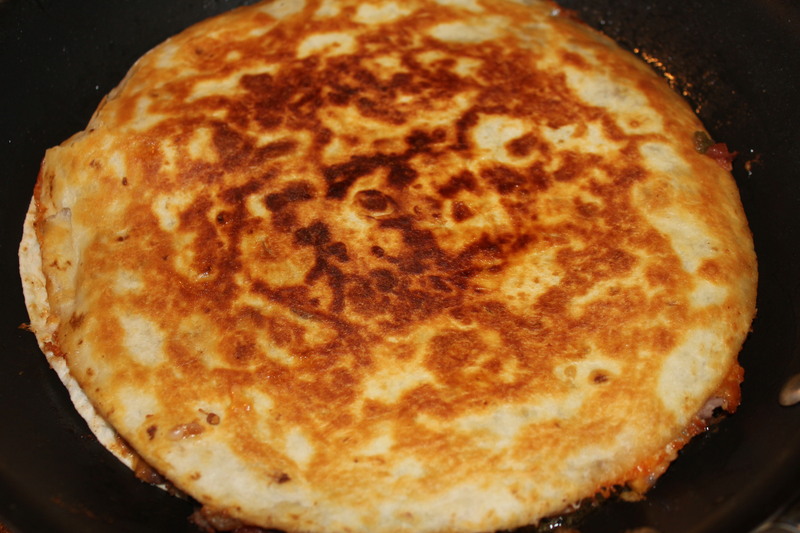 Warning – this can be a little bit tricky and you may want to place a large plate over the top of the skillet, flip the quesadilla onto it, and then place it back into the pan. Cook until the bottom is brown and transfer to a plate. Cut into 6-8 slices using a pizza cutter. I like to serve this with sour cream, guacamole, salsa and chips, margaritas, etc. Here’s to you, Mamma, for inspiring these great recipes! 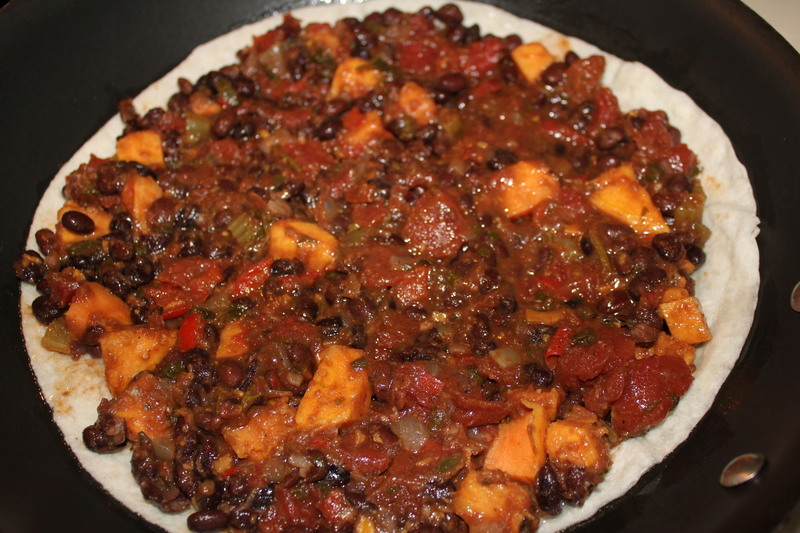 This entry was posted in Food of the Month, Recipes, Vegetables/Vegetarian/Vegan and tagged eat drink and be merry, Food of the month Kel's Cafe of All Things Food, kel's cafe of all things food, Kelley Chisholm blog, Sweet potato black bean chili recipe, sweet potato black bean quesadilla recipe, Sweet potato recipes, Sweet potato skins recipe, vegetarian recipes. Bookmark the permalink.